DCW Jones, a waterworks engineer, sent a letter to a colleague expressing concern about the danger of the coal slurry being tipped at the rear of Pantglas Junior School. Local councillor Gwyneth Williams also expresses concern in a letter about the coal waste - fearing "it could threaten the whole school''. Two mothers present a petition to the school's headmistress about flooding concerns caused by tip number seven. It is later discovered that the mountain of coal waste had been dumped on top of several underground springs. 7.30am - Mine workers arrive at work on a foggy morning to find tip number seven had sunk around 3 metres (10 feet) overnight. 9.00am - With no phone lines on the hillside, a coal worker walks down the mountain to tell bosses about the sinking problem. By the time the order to stop adding to the tip is given it has sunk 6 metres (19.5 feet). By now the school bell has rung at Pantglas and 240 pupils go inside in an excited mood on what was their last day before half term. 9.15am - The tip gives way and 150,000 tonnes of liquefied slurry slides down the mountain and towards the village of Aberfan. The slurry hits the school and houses on Moy Road with an almighty force. 9.50am - Fire crews are now on the scene and describe it as "utter pandemonium''. Firefighters, emergency services and miners begin an around the clock battle to dig out those trapped by the debris. 11am and midday - The last survivor, Jeff Edwards, is pulled out from the rubble. He had been pinned for more than two hours with the head of a dead girl against him. As news of the disaster emerges, miners and residents from neighbouring communities rush to Aberfan to help with the rescue effort, forming a conveyor belt of "bucket brigades'' to help move the waste away quicker. 11.30am - A burst water main knocked out by the avalanche is finally switched off. Mid to late afternoon - Hope of finding more survivors begins to fade with rescuers now only finding dead children. Eyewitnesses later describe seeing the children still sitting at their desks entombed by the slurry. Evening - A make-shift mortuary is set up at a local chapel. Families of those missing identify their loved ones. It later emerges that among the dead are school headmistress Mrs Jennings. 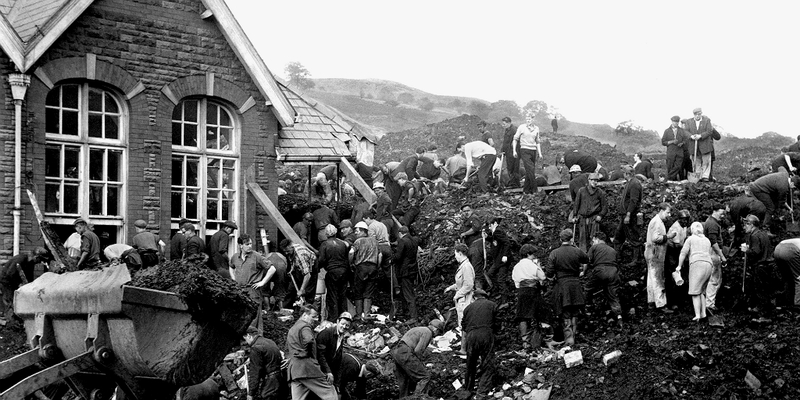 November 29 - Tribunal into the Aberfan disaster begins, chaired by respected Welsh barrister Sir Herbert Edmund Davies. The inquiry lasts 76 days and sees 136 witnesses called and more than 300 exhibits examined. January - A disaster fund to aid the village and bereaved, launched by the mayor of Merthyr, was closed after receiving nearly 90,000 contributionns. The fund was worth £1.75 million overall. August 3 - The report into the Aberfan Disaster Tribunal is published. It blamed "bungling ineptitude by many men'' who had failed to heed clear warnings. It said: "Not villains but decent men, led astray by foolishness or by ignorance or by both in combination, are responsible for what happened at Aberfan.'' No-one is prosecuted nor loses their job. The Government repaid the village £150,000 - the same figure drawn from the disaster fund for the removal of the remaining tips 30 years earlier, when the National Coal Board and the Treasury refused to accept full financial responsibility despite outrage from villagers and donors. 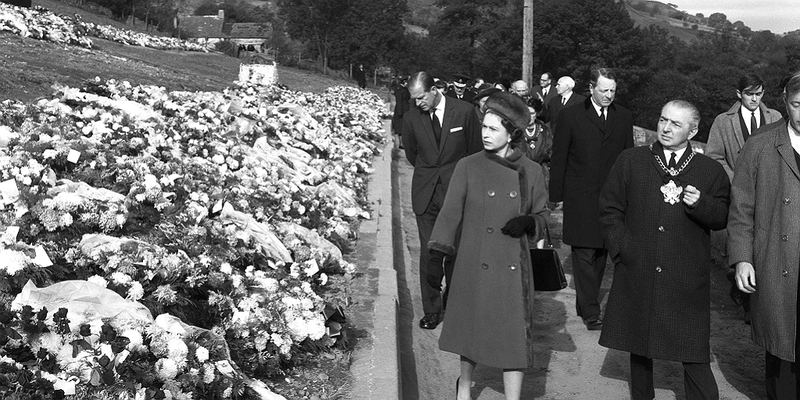 July 9 - The Queen brought the largest gathering of survivors and bereaved of the Aberfan disaster together since the disaster during her third visit to village. She paid her respects just eight days after the disaster and returned to open the community centre in 1973.